Fast Free Laws is a service that was set up long ago by Friend1234. Its exact date of origin is unknown, however it is estimated to have begun in May 2005. Fast Free Laws is based in World 66. Basically, hundreds of people bring un-noted Pure Essence to the Law Altar on Entrana, and trade us (the crafters) for Law Runes (Laws) and noted Pure Rune Pure Essence back. The advantage is that you get free laws, and you don't lose any Pure Essence. You just have to run essence for us. Let's start off with Pure Essence running. 1x Boots of Lightness (-4kg). 1x Spottier Cape (-4kg or -5kg depending on your weight). If you are Using Falador Teleport or Paddewa Teleport then substitute the Law Runes and one Pure Essence for the Elemental Runes you need for the Teleport Spell that you are using. Go to the Draynor bank. Withdraw 27 un-noted Pure Essence, and either a Law Talisman or Law Tiara. Take the ferry to Entrana via the monks at Port Sarim docks. Head to the law altar. 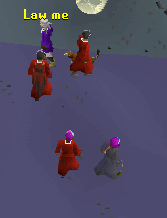 Find a person dressed in Zamorak Robes. Right click on the person and choose the Request Assistance option. Craft your Law Runes as you normally would. Even if you don't have the appropriate level to craft them, you will be able to since you requested assistance from a player who can make Law Runes. Voila, 27 free laws. You can continue into eternity, as there are always crafters at the Law Altar. Withdraw 26 un-noted Pure Essence, 3 Air Runes, 1 Water Rune, and either a Law Talisman or Law Tiara from the West bank. 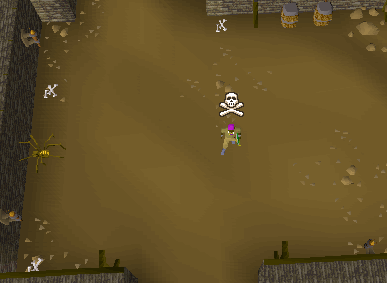 Go to the shortcut under the South wall and go through (if you don't have 26 Agility to do this then bank at Falador East bank). 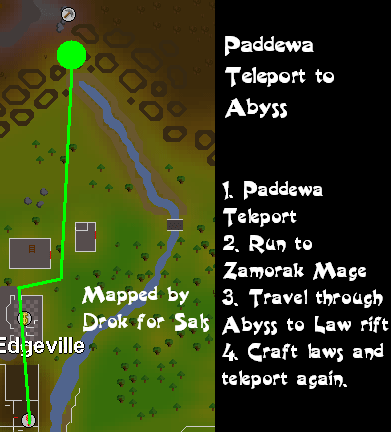 Teleport to Paddewa (Edgeville Dungeon). You will appear somewhere in the image below. Climb up the ladder to the South then run North to the bank. Withdraw 26 un-noted Pure Essence, 1 Air Rune, 1 Fire Rune, and either a Law Talisman or Law Tiara. Run to the Zamorak Mage located in level 5 or 6 Wilderness (beware of pkers) and teleport. Get into the center circle. Go to the Law Rift and enter it (just East of the North part of the center ring). Looks like any of the other Rifts, but has a Blue Law Rune symbol that fades in and out. When you go through the Rift you will appear just South of the most Southerly arch surrounding the crafting Altar. Teleport to Edgeville with your Glory Amulet. Withdraw 27 un-noted Pure Essence from the bank. Go to the Law Rift and enter it (just East of the North part of the center ring). Tip: Make sure to thank the crafter that you requested assistance from. We are taking our time to give you free Law Runes, so just a little "thanks" can go a long way. Remember, this is a free service. If you are inside the Altar then don't stand in the line that crafters run up and down if you want to get assistance, stand just to one side. Remember to only request assistance from the crafter once. 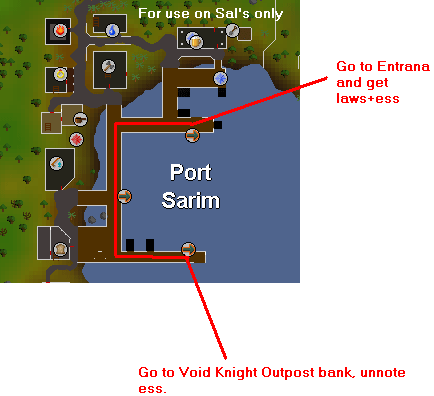 Speak to the Squire in the southern part of Port Sarim. Ask to go to the outpost. Head to the bank and take out 27 unnoted pure rune Pure Essence. Speak to the Monks in northern Port Sarim. Ask to go to Entrana. Leave Entrana and head back to the outpost. Crafting is a lot more simple. As long as you have 54 Runecrafting, and patience, you should be able to pull it off. 1 Law Tiara (You can get a law talisman from the Troll Stronghold Quest and then merge the Talisman into a normal Tiara by using the Talisman with the altar while having the Tiara in your inventory). As much noted Pure Essence as you want to craft (9.5 xp per Pure Essence). It must be noted. 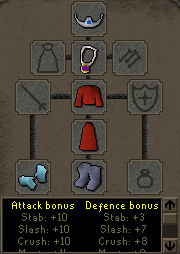 Equip your stuff, and head to Entrana with your noted Pure Essence and 27 Laws. The 27 Laws can be substituted for 27 un-noted Pure Essence so that you can craft your starting Law Runes once you get to Entrana. Once the trade screen is up quickly put up all 27 of your Law Runes by selecting "Offer all" and put up 27 Pure Essence by selecting "Offer X" and typing in "27". If the person that you are trading with puts up less than 27 Pure Essence then just click once on each pile for each Pure Essence less than 27 that they have offered. You must accept the trade as long as they have put up 24 or more Pure Essence. 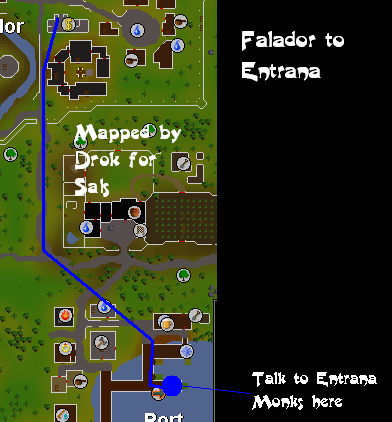 Once you have traded (as above), go into the Law Altar and click your mouse quickly in the direction of the Altar (North of where you enter). If you don't select the Altar then as you are Running click again, but this time make sure you select the Altar. Craft your Laws. As you are crafting re-position your camera so that as soon as the Laws are crafted you can click on the portal and make a quick exit. As you are running to the portal type the thing that you are going to say once you get outside. You can do this for as long as your Pure Essence lasts. If you are doing well then you can complete steps 2-5 in under 20 seconds and will be losing energy each run which means that you are making over 4000 Laws per hour! Tip: If somebody puts up 28 Pure Essence, don't decline the trade, just say "27" and they should remove one Pure Essence for you. The main thing that crafters are afraid of is being shorted. This means that the runner hasn't given them as many Pure Essence as they were given Law Runes and the crafter doesn't have enough Laws for the next trade, therefore having to go back to the bank to withdraw some more Law Runes. Always check the second trade screen because some runners will remove a large proportion or the Pure Essence at the last minute and only give you 2 or 3 Pure Essence to craft. Occasionally when you enter the Altar the picture on the noted Pure Essence will disappear. Nothing to worry. When you exit the Altar again it will be back to normal. Sometimes on a busy days with people coming almost non-stop there are occasionally times where there seem to be no runners. There is nothing to worry. As long as you have seen that there are a lot of people running there is no need to leave. There are often a lot of runners at weekends which means that crafters will get the most experience then. 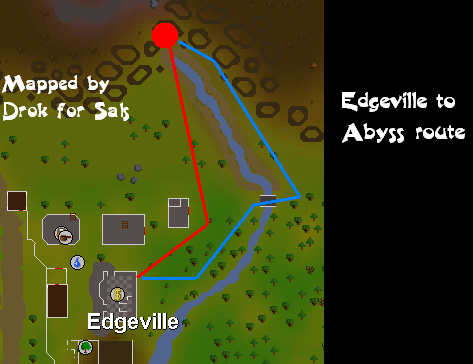 Often during the week when there aren't many runners and you will be getting better Runecrafting xp by using the Abyss to make Nature Runes. If you want fast Runecrafting xp but you are saving up for that pretty Party Hat then just craft your own Runes during the week and sell them so that you can buy Pure Essence to craft Laws at the weekend. Doing this will get very fast money and very fast xp. So get out there, and lend a hand to Fast Free Laws, or help them achieve their Runecrafting goals by running for them.